The mountain is a rugged environment best left for young, strong people who are willing and able to tolerate navigating the treacherous roads, as well as the cold rainy winters. Large parcels of property requiring extensive maintenance become an ongoing venture that tends to be overwhelming. So, as people age, they are inclined to move out of our community to somewhere where the living is easier. Over the years, the roads have become safer and the power doesn’t go out as often, or for as long a period of time. A lot of people own generators, and whole house generators are even more reasonably priced. Highway 17 opened in the early fifties, improving transportation to and from town, and it has been upgraded over the years with the addition of the white center dividers, that have vastly improved the safety factor. But it does take a certain constitution to endure the hardships of existence here in the Santa Cruz Mountains. Consequently, there are few people in our community who are in their twilight years. Kate Desin Radonich is an exception to that rule, she moved to California from Croatia when she was just twenty years old and has stayed, raising four children, who all still live on the property, or nearby. Now the grandmother of sixteen, great-grandmother of forty-two, great-great-grand-mother of six, she lives a rich full life on the property where she has resided for over 85 years. Kate Desin came to America with three girlfriends in September of 1922. She was following her two brothers, Andrew and Louis, who had emigrated after World War I to escape the ravages of war. 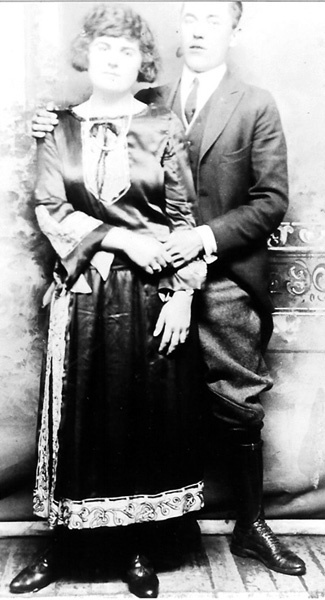 They came to California to work on the ranches, where they met other Croatians. The girls made their way across country to join Kate’s brothers in San Francisco. Kate worked in a hat factory for a year before her brothers purchased property in Los Gatos, prompting her to come down to keep house for them. 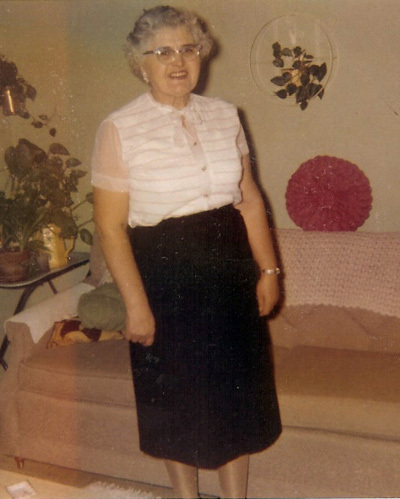 She met other members of the local Croatian community, including Billy Radonich, through her brothers. 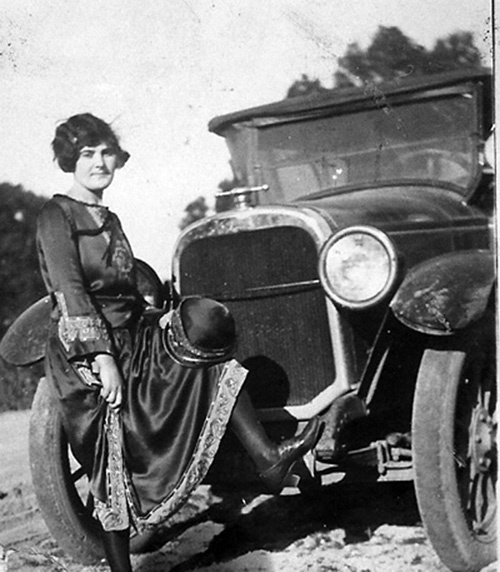 Billy and Kate were married at St Mary’s Church in Los Gatos on January 1, 1925, Kate’s 23rd birthday. The reception was held in the packing house that had been built by the Yoneji’s in 1910. The packing house used to pack the fruit for delivery to town, has been tenderly and meticulously maintained by the family to this day and is still being utilized for various events for the benefit of the entire mountain community. On June 16, 1919, three years before Kate came to America, Bozo (Billy) Radonich had purchased 125 acres of land in the Santa Cruz Mountains from Saburo Yoneji, and his wife, Take, for $40,000. Having just returned from fighting in World War I, he was 23 years old and single. His father was the co-signer on the loan. This land had been part of the Soquel Augmentation Land Grant that was awarded to Martina Castro. The land grant first appears on the roll of Santa Cruz County in 1850. The property was then divided between the eight Castro children. From there it changed hands several times. The property was sold to F.A. Hiln, who then sold it to D.H. Montgomery in 1864. In 1903, Montgomery sold 125 acres to Yoneji. Included in this sale was an extra 5 acre parcel purchased from E.E. Meyer, who had purchased the land from Lyman Burrell. The property purchased from Meyer was known as Evergreen Farm, which is the name the Radonich family has used ever since. The sale included all of the equipment needed to operate the farm, as well as a main house, four houses for the hired help, a laundry house, chicken coop, blacksmith shop, packing house, seven horses, and an old barn. When Billy purchased the farm, it was a working ranch, planted with pears, apples, and prunes. Billy’s father, Pero Radonich, had come to America from Croatia in 1905. He returned for his two sons, Billy and John in 1911, but was unable to bring his wife and three daughters here until 1921, because of the interference of World War I.
Pero passed away in 1927, followed by his wife, Stane, in 1929. The Desin family lived seven miles from the Radonich family in Croatia. Both family names appear as citizens and landowners in the area’s first census taken in 1673-74. It is believed that both families predate this census by hundreds of years and today the family properties are still owned by direct descendents. Billy and Kate had four children: Peter was born on October 10, 1925, with Andrew following a year and a half later on May 8, 1927. Another year and a half later, William was born on December 31, 1928. 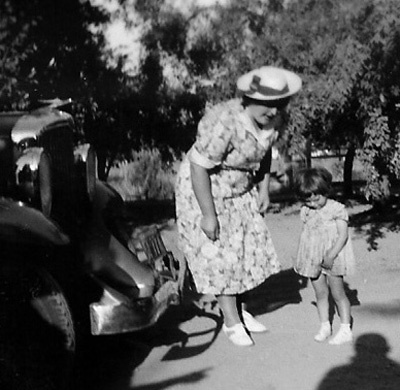 Six years later, after the depression, their daughter, Nancy, was born on October 27, 1936. Life was difficult with four young children in such a rugged environment. They rarely went to town because transportation was difficult at best, and Kate wasn’t yet proficient in the English language. A grocery truck came up from Soquel once a week and there was a market, gas station and bar at Holy City. 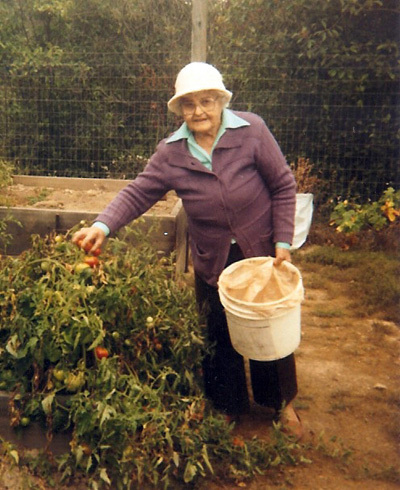 Kate busied herself with her large vegetable garden and flower garden. She canned fruits and vegetables, as well as knitted and crocheted. Always an excellent hostess, she entertained guests with coffee and cookies. It was small, quiet community where everyone knew each other. They helped their neighbors, and in turn when they needed help, the neighbors were there for them. The Radonich’s got electrical power in 1936, shortly before Nancy was born, but it took several more years until the people above them on Adams Road had electricity in their homes. Wright’s home, then it became a car repair garage before being transformed into a local market. Named “The Store” in Spanish, it stood almost in its original form until the 1989 Loma Prieta Earthquake destroyed it beyond repair. It was rebuilt after much protest from Santa Cruz County because of the dangerous curve it sits on, and is now called the Summit Store. The depression and World War II both took their tolls on the farms in the mountains. All of the young men on the mountain went to fight in the war. Three young men who graduated from the Burrell School, as well as one each from Hester Creek and Laurel died for our country. Several more, including Peter, settled elsewhere. As irrigated farming in the Santa Clara and San Joaquin Valleys became more prevalent, dry farming in the mountains became too costly, squeezing Billy out of the business. The land was subdivided in the 1950’s and the property on the west side of Radonich Road, including the property which is now Hillside and Hillhaven Roads were sold off to developers. The Burrell Fire Station and many homes now occupy the property. Thirty-five of the original acres are still intact, with seven additional acres that were gifted to family members that are still owned by members of the family. After the children were gone, Kate took a job down in town at a fruit packing plant. 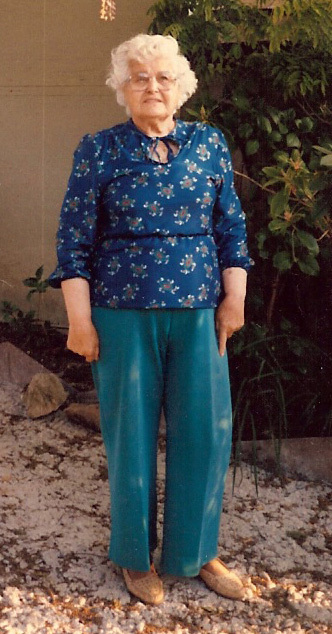 She commuted with a neighbor until she retired at the age of 62. She kept active watching grandchildren, while attending her gardens. In the late sixties, Billy and Kate decided to plant Christmas Trees on their property, as a source of income. They shied away from wine grapes because their property lacked the afternoon sun required to be successful for growing grapes. Shortly thereafter, in 1970, after a short illness, Billy passed away. Kate has continued to live an active life with her enormous extended family for many years. 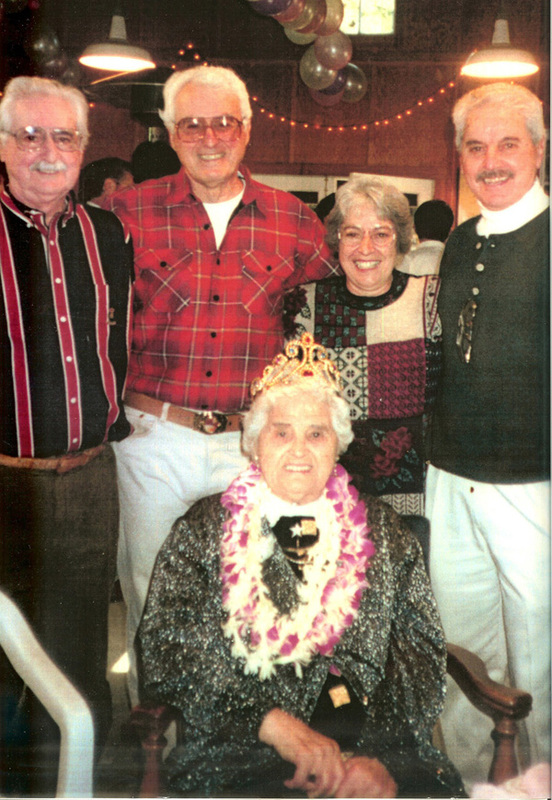 Staying involved in the community, she is the longest participating, oldest member of the Loma Prieta Club. Several of her children moved to town when they became adults. Now, Nancy and Peter are back living on the property, Bill is on Loma Prieta Avenue, and Andy is living in Aptos. Numerous grandchildren and great-grandchildren live near by, with several being close on the mountain. The property is maintained by the family and the packing house has become a community landmark. The barn across from the packing house was originally built before the Radonich family owned the property and it burned down in 1922, taking Billy’s 1919 Packard truck with it. Rebuilt in 1923, it stood until being knocked of its foundation in the 1989 Loma Prieta Earthquake. It has now been restored to complement the packing house for gatherings. The original farmhouse, to the right side of the packing house, is small with three bedrooms and one bathroom, that was added somewhere along the line. It is currently being remodeled to be rented. Kate is living in a mobile home next to the farm house, right at the bottom of Radonich Road. She is not as mobile as she once was and doesn’t see or hear well, anymore. But, she is still sharp and enjoys entertaining her extended family and many friends. She still possesses her infectious smile that makes the visitor feel so welcome. She always invites her guest for coffee and cookies, just as she did years ago when she was a youthful bride living in the mountains with her young family. All of the information contained in this article came directly from Nancy Campi Radonich, Peter and Janet Radonich, and Bill and Susan Radonich. I thank them for being so gracious with their time and assistance, and for sharing their very precious family memories.